There are only two bedrooms on the main floor of our house, the master bedroom and a large-ish room at the front of the house. For the first few months that we lived here, I used it as my office space, but it just didn’t really work for some reason. Then I had the idea to move my office to the big space above our garage on the other side of the house and make the old office our playroom. I had been a little worried that toys would end up migrating all over the house with this set up, where the playroom is right by the living spaces, but really, it’s been so great. I love both the studio space and this playroom, which we only very recently decided to quickly decorate in time for the Domino shoot. 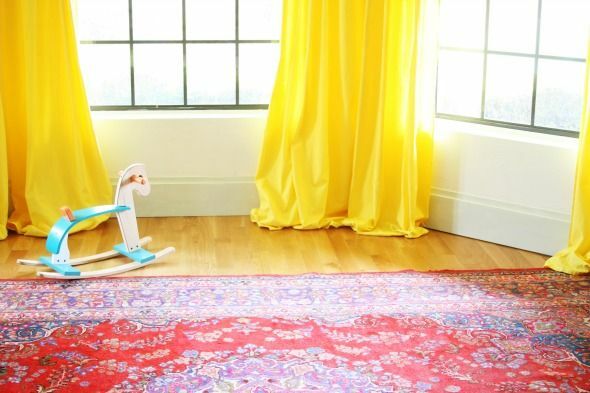 We had been planning on doing Evie’s room as the kid’s space in the spread, but the playroom ended up being the easier space to photograph in the end, so we threw this room together in about seven crazy days! 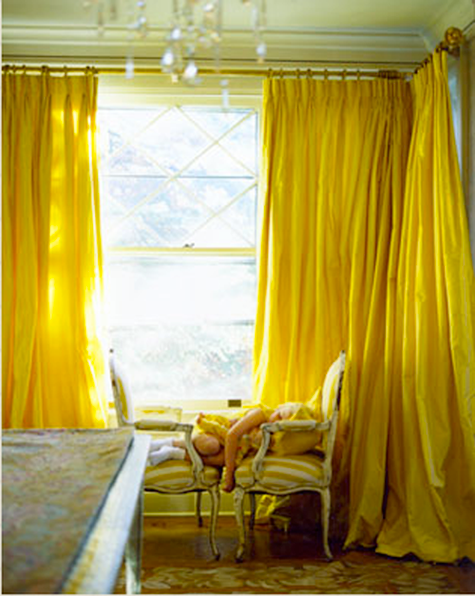 These yellow curtains were our jumping off point. 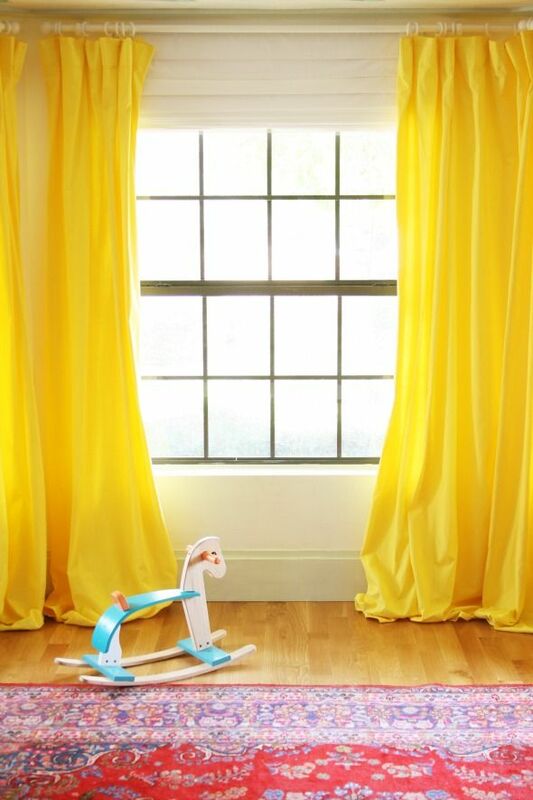 I wanted this room to feel girly and playful, and I thought pretty curtains were a great place to start. 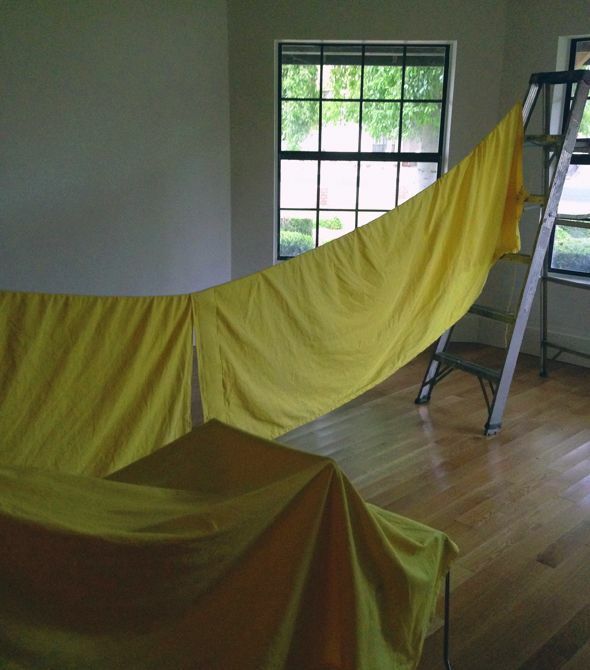 We had no time and really no budget to make fancy curtains though, so IKEA came to the rescue. 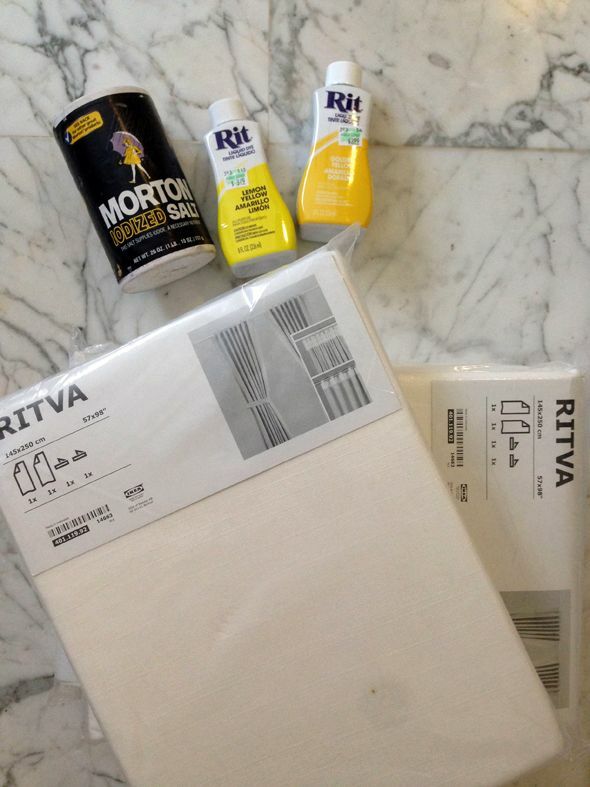 I had actually picked up three packs of these white cotton Ritva panel pairs a couple months before (when the room was still an office) and I just hadn’t got around to hanging them yet. I almost didn’t use them because I wanted the walls to be white, and I wanted the curtains to be a fun color to pop off the white. This image kept coming to mind when I was brainstorming colors. I only wish I had the budget to recreate these exactly! I figured it wouldn’t really be a wasted effort to try and dye the IKEA panels because I wasn’t able to return them at that point. 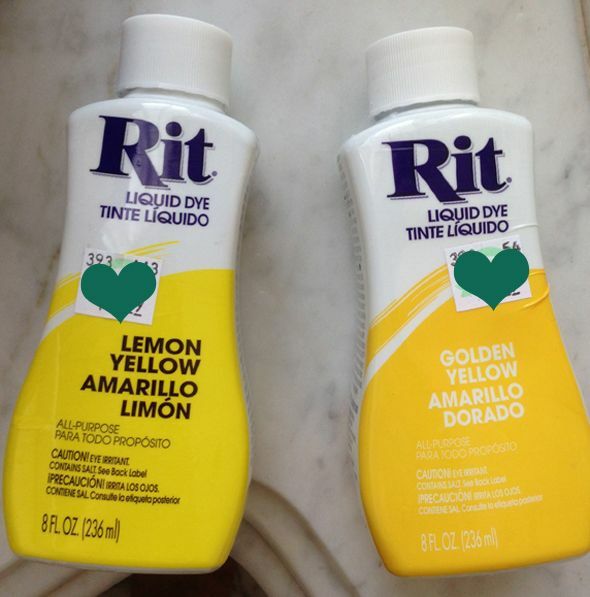 So I picked up four bottles of RIT dye – two each of Golden Yellow and Lemon Yellow. It’s not for everyone, or for every tub, but I felt comfortable with dying the panels in my bathtub. I tested the dye beforehand and there was no staining on the fiberglass, so I felt good about moving forward using my tub. It made the project and clean up about a million times easier than using a big tupperware tub (and I have a front-loading washing machine, so that wasn’t an option). I got three of the panels wet in the shower first (which helps the dye soak up more evenly) while I filled the tub with about six or seven inches of the hottest water I could get out of the tap. I added one bottle of each of the two yellow colors and about half a cup of salt. Once that was all mixed, I put in the three panels and while wearing long gloves, moved the fabric around in the dye bath for a good 20-30 minutes until the color looked bright and even. I turned on the faucet again, to cold this time, and let the dye bath drain and the cold water run on the panels until the water was close to clear. I moved the panels to a laundry basket and took them to the washing machine for a cold water wash on the delicate cycle. I made a hanging station and let the panels air dry over night. And then I started again with the second batch of three panels and two more bottles of dye. Then we ironed each panel well before hanging them over white fabric shades from Lowes (which were less than $20 for the 48″ size!) and white wooden rings and rods, also from Lowes. 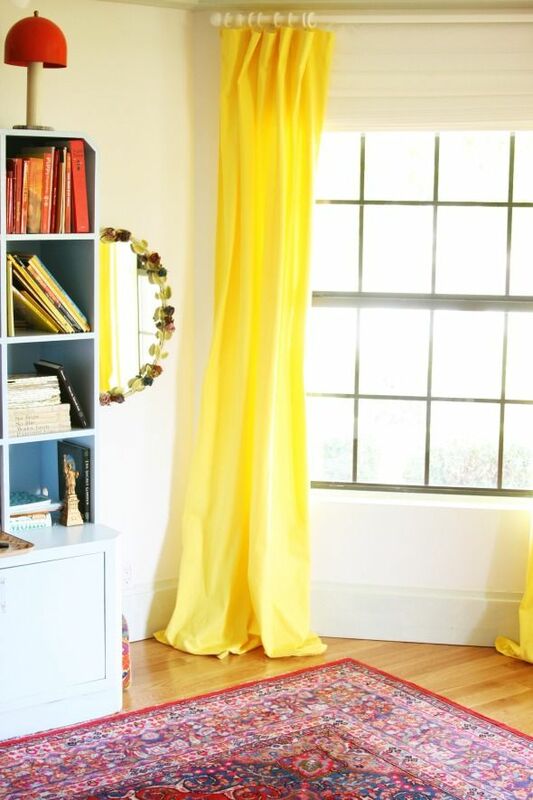 I love, love, love how these curtains turned out. Because I had bought the IKEA panels so many months before, it practically felt like a $12 project, where I just had to buy the dye. :) And I think the color combo of the lemon and golden yellow colors really worked out perfectly, which was sort of a lucky break. I think when I have some extra time I’ll add a thick or even black out lining to these to add some weight and a clean white backside view from the front of the house (though the white roman shades help a bit with that for now). Have you had any successes with dying big projects like this? Have you used your tub or a tupperware container? Lovely but I echo those who ask you not to patronize hobby lobby for any reason! Not worth it considering the way they treat their female employees. 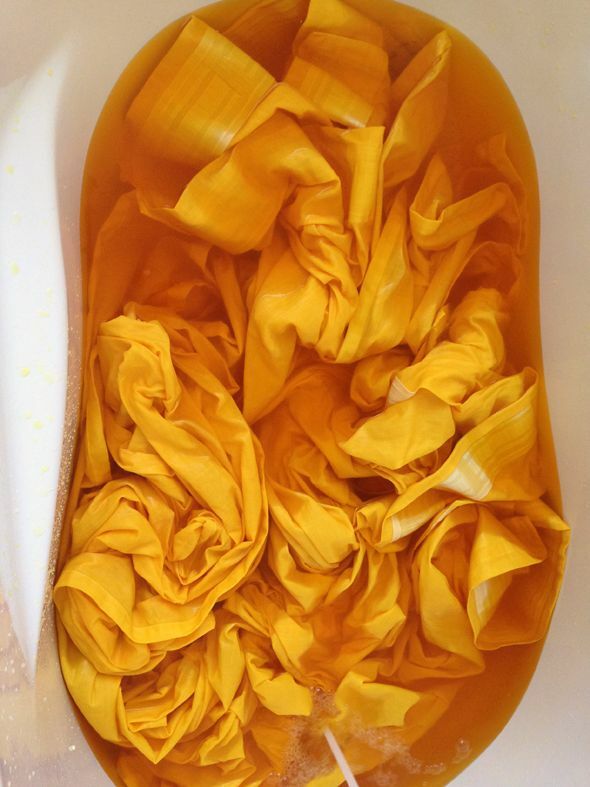 To DYE for! 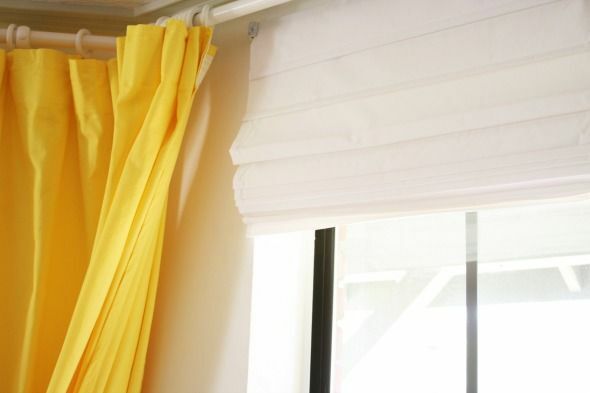 I love, love, love yellow curtains and these are going to my top-5 list. Man, I can't believe the crazy comments about Hobby Lobby. How they treat their female employees??? I guess I still don't get why any employer has to provide birth control in any form to their employees… anyway, don't their employees have a choice not to work there? If they choose to work for a company that doesn't provide it due to their religious beliefs, then shop away… no one is enslaving anyone here. I just find it funny cause I bet the same people boycotting this company shop at stores every week that employ literal child slave labor in other countries but don't feel a tinge of guilt. Because it makes them feel important while actually not really doing anything but judging other people’s choices. Thank you, thank you, thank you! Just made these and I love them so much! Curious if you ever ended up adding a black out liner?